I can’t believe it’s already September! The kids are safely (and happily) in school for a new year…and I admit that I am missing all of the time we spent together this summer. One good thing about the school year? I’ve got a little more time to work. I’m still adjusting to being back home…the early mornings getting kids up and ready for school, the quiet middays, the long afternoons with homework and outdoor play time. If you’re trying to adjust to a new Fall schedule like me, and finding it a little difficult to get back into the groove, these blog prompts might help. Enjoy! These writing prompts are simple, so they can be easily adjusted to your style and needs. I’d love to see your posts, so feel free to leave the links below! Share a selfie! What do you wear to take your kids to school? Pinterest round-up – what are some of the Pins you’ve been inspired by lately? If you could interview a celebrity, dead or alive, who would it be (and what would you ask)? Who was your favorite teacher and what would you say to him or her today? What have you been blogging about lately? 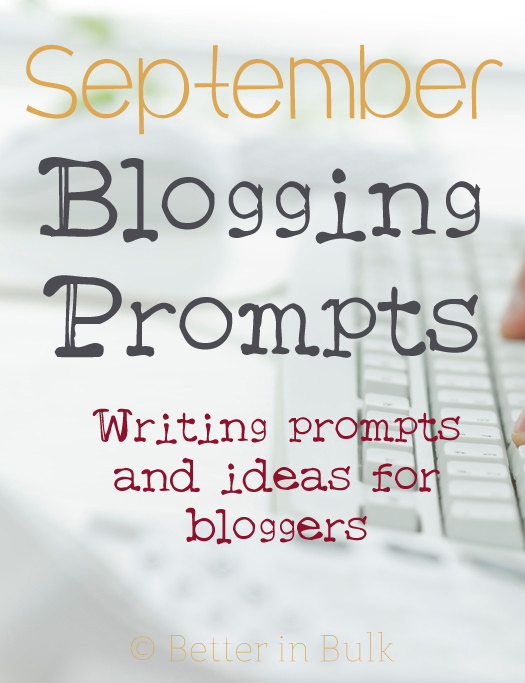 Lolli, I had no idea you had a series on Blogging Prompts! I googled it yesterday because I’ve been in a writing “funk”. lol Up you popped! :-) You have some awesome suggestions. I have been writing a lot of sponsored stuff, but really just want to write something fun. I do not have “fun” oozing from my pores so coming up with something to write about has been a bit of a challenge. :-) Thank you for providing this! Yay! I’m glad you found these! I post prompts on the 1st Sunday of every month, so I’ll have a new slew of ideas this coming Sunday. Now if only I could follow my own advice a little better…lol!